Coping with end-of life issues and care is stressful. It’s stressful on the family, friends, and and especially on the loved one with a terminal condition. Why add to that stress by uprooting them by sending them to a nursing home facility? Does it make sense to move someone out of the comfort of their home, away from friends and family when they need them most? Today, people may stay at home with the support of a hospice care agency to manage medical issues, and a qualified in home caregiver to provide ongoing care and assistance. A Better Living Home Care can help by providing highly compatible, reliable live in or hourly caregivers, senior helpers, and home health aides. We go out of our way to provide our clients with affordable and flexible in home care that relieves the many burdens on family. 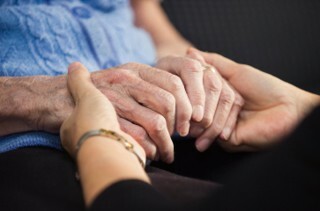 In-home care support for hospice patients has become common place and is found to have positive implications for the health of cancer patients. The reasons why more families are choosing in home care over nursing home care is due to the fact that most hospice patients are most comfortable and secure being cared for at home. Our hospice clients receive personal home care assistance that cannot be matched by an assisted living facility. We’ve found that our cancer clients desire independence, like to spend less time in the hospital, and do not wish to be separated from family, friends, and familiar surroundings. We’ve also found that home care tremendously reduces stress which is paramount to leading longer, healthier, and happier lives. Home care also offers relief and peace of mind to caregivers caring for a family member who is in the home or in a different location. A Better Living Home Care is dedicated to making life with cancer easier. Our at home caregivers, senior helpers, and home health aides have advanced knowledge of the many cancers that afflict people. Better Living’s caregivers provide a wide spectrum of care, assistance with daily activities, as well as other activities instrumental to independent living. Home care is the affordable and flexible alternative to nursing home care. Not only will you be able to cut health costs, you will be in control of your home care assistance. Whether you need home care just a few hours a day or 24 hours 7 days a week, you benefit from flexible caregiver services. Choose from live in care or hourly care. For your convenience, our knowledgeable staff will even arrange for care over the phone and we offer a free in home care consultation. A Better Living Home Care is dedicated to providing you with the best in home care services that are affordable and fit your unique needs. Contact us today and start living easier with cancer tomorrow!